Solaz Hostel Santa Marta, as the name suggests, it is an invitation to relax, rest and enjoy the serenity this place offers, as well as a little bit of history and native culture of the city of Santa Marta. The Hostel is located in the historical center of Santa Marta, only four minutes walk away from the emblematic park of the Bride and Groom, seven minutes away from the Santa Marta beach, one hundred meters away from the Public Market Square and one hundred meters away from the Ferrocarril avenue where guests can take any type of transportation to to visit the tourist sites of the city, such as: Tayrona Park, Rodadero beaches, Minca, Taganga, etc. It consists of six spacious shared rooms and one double room with private bathroom, for a total of seven rooms distributed in two floors. All the rooms with air conditioning, individual closets, bathroom mixers in the first and second floor. On the second floor is also a large seating area with a 50-inch television and international channels, a fridge full of snacks and beverages, kitchen fully equipped for the comfort of guests where they can prepare the food they wish, a dining area, a nice balcony with view to the street and finally a third floor where they can enjoy the famous breezes of Santa Marta. 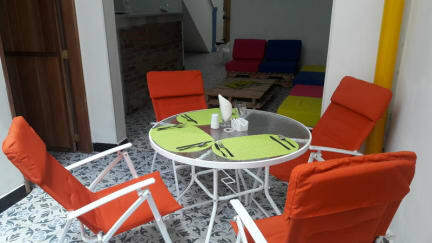 All the rooms have WI FI internet connection, free, as well as in all the common areas of the Hostel. Insurance and Contribution Hotel: EUR 1,00 each person per night. (optional). Breakfast included. Additional breakfast: 4.00 euros. We loved our stay at Solaz hostel. The value for money is just incredible. We had the twin room (which is one bunk in a room with private bathroom) for just 14 Euros a night for 2 people. That includes A/C (very much needed in Santa Marta) and an awesome breakfast (fresh fruit, yoghurt, omelette, rolls, jam, tea/coffee, fresh juice and cornflakes). The twin room is a bit small but sufficient and the hostel might not win a beauty contest but for that price, you can have a great and relaxing stay. Alles neu, top zustand und sauber! Sehr leckeres Frühstück, hilfsbereite Mitarbeiter und fußläufig alles in der Innenstadt schnell erreichbar. Alles ist ganz neu und super sauber! Allerdings ist nicht nicht genug los was die Atmosphäre angeht aber das wird auch noch. Tolles Hostel und leckeres Frühstück! Comfy beds and fast wifi. The cheap twin room is really a dorm for 2, but worth it. We did tjähe lost city trek from here and came back one day early so we slept also 1 night in the dorms (which are okay) and all rooms have newish AC (a must for a good sleep in Santa Marta). The free breakfast comes with eggs,bread, jam, coffee, Fruits, yoghurt and cereals. Good value! If you are planning to go to Parque Tayrona this hostel has the best location. The bus stop is just 5 minutes away by walking. Staff is super nice and they will help you in any case. 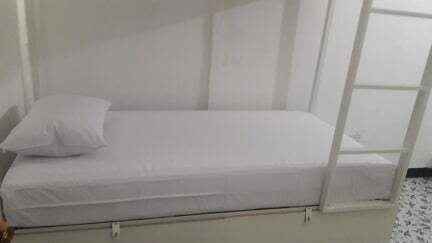 I felt really comfortable in that clean and quite modern hostel. It has AC, a super clean kitchen with lots of equipments and the breakfast is the best I have ever got! Its a new hostel, so the good atmosphere still has to be built ;) But it really worth to check it out! Ganz neues Hostel, im zweiten Stock wird noch gebaut. Sehr hilfsbereite Mitarbeitern, gutes Frühstück. Die Matratzen sind extrem hart aber alles sehr sauber. Große Schließfächer unter den Betten. Lage gut, ganz nah am Markt wo auch alle Busse nach Minca, Tayrona etc abfahren. Ins Zentrum mit Bars und Restaurants sind es ca 5-10min zu Fuß Die Atmosphäre ist gleich null, wird wahrscheinlich besser wenn das Hostel fertig ist. Preis/Leistung ist aber top!! Das Hostel liegt in einem abgelegenen Stadtteil, indem es ziemlich heruntergekommen ist und viele komische Leute herumlungern. Die Zimmer sind ganz in Ordnung, aber die Locker kann man nicht abschliessen. Ausserdem kann man von oben und aussen hineingreifen, auch wenn sie verschlossen wären - völlig unsicher! Das Bad war völlig dreckig, geputzt wrde nur oberflächlich, überall lagen alte Haare herum. Es gab nur eiskaltes Wasser und davon kam fast nichts raus. Extrem schlechte Preisleistung! !